The Vegetation Mapping and LiDAR Program is thrilled to welcome Dr. Jordan Golinkoff as the newest member of our Vegetation Mapping and Remote Sensing Advisory Committee. The committee advises the mapping team on state-of-the art mapping techniques and methods. Dr. Golinkoff is an expert at using LiDAR to help map, measure, and manage forestland in Northern California. A Forest Carbon Analyst for the Conservation Fund, Dr. Golinkoff will add to the Advisory Committee’s LiDAR and forest mapping expertise. Dr. Golinkoff is one of the nation’s leading experts on forest carbon project development, monitoring, and verification. He joined The Conservation Fund in 2005 and has extensive experience in forest inventory and projection methodologies, statistical analysis, and carbon accounting practices and standards compliance. 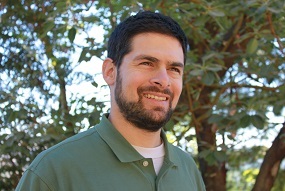 A trained forester and Climate Action Reserve and California Air Resources Board approved verifier, Jordan is responsible for forest inventory design and carbon offset registration for The Conservation Fund, the nation’s largest seller of verified forest carbon offsets. Jordan has a B.A. in Computer Science from Yale University, a Masters of Forestry from Duke University, and a Ph.D. in forest mensuration and biometrics from the University of Montana. This entry was posted in Advisory Committee, LiDAR on November 12, 2013 by admin. 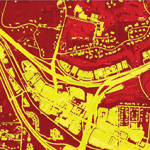 The benefits of LiDAR for land and water management, planning and engineering are wide ranging. The following discussion demonstrates some of these benefits as they apply to Sonoma County. 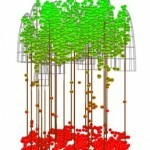 LiDAR data is used to create automated forest structure metrics, such as tree height and canopy density. Forest structure metrics can be combined with forest plot data to produce accurate models of forest biomass and aboveground carbon sequestration. Read this 2010 New York Times article titled “New Map Shows Measuring Carbon in Amazon Is Feasible.” See the videos at the bottom of this post for more on using LiDAR for forest management, forest inventory and biomass mapping. One of the main products of the Sonoma County Vegetation Mapping and LiDAR program will be a fine scale vegetation and habitat map of the entire county. 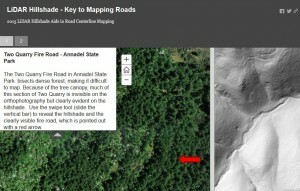 Mapping vegetation involves developing a classification of the county’s vegetation types, interpreting aerial photographs and imagery using human interpreters and computer algorithms, and verifying vegetation characteristics in the field. LiDAR data is extremely useful for vegetation & habitat mapping, as well as riparian area mapping and crop type mapping. PG&E and other utilities periodically collect LiDAR data for their transmission lines. One major application of this data is to target danger trees for removal. 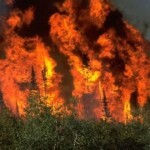 If a danger tree falls in the direction of a high voltage line, it could hit and damage the line or start a wildfire. 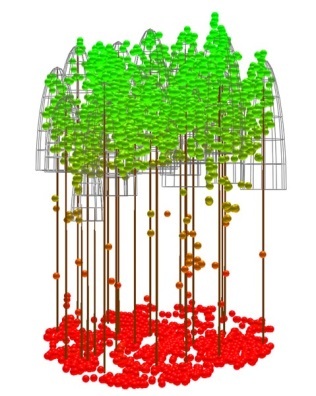 Danger trees are identified by combining LiDAR derived tree height & location information with LiDAR derived line height & location information. Highly accurate digital elevation data is a prerequisite for accurate floodplain mapping and flood inundation modeling (from river flooding, tsunami, or storm surge). 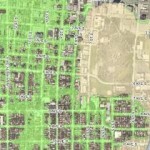 High resolution LiDAR-based DEMS greatly improve the accuracy of flood mapping. Using LiDAR data, a team of researchers from the College of Staten Island successfully predicted coastal inundation extent resulting from Hurricane Sandy. An article in the February 13, 2013 New Yorker Magazine states “The C.S.I. study had predicted the extent of flooding uncannily-the projected flood zone proved to be accurate to the street, and almost to the house.” Click here for the New Yorker article. Read this article about flood management and planning in the Red River Basin of the North Dakota. LiDAR is used to create very accurate DEMs and contours that characterize the landscape in a much more refined and detailed way than 10-meter USGS DEMs. 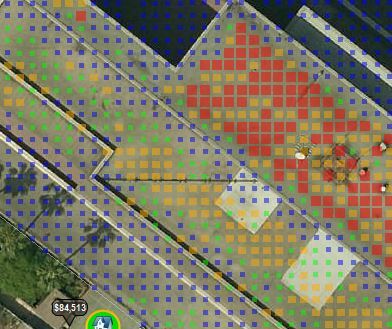 The ability to map micro topography is important for crop planning. 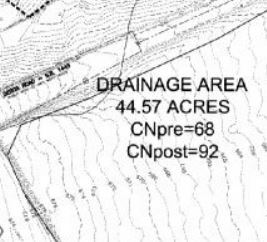 For example, vineyard managers use topographic maps (and other data) to divide a vineyard into zones based on physical site properties, climate, and soil type. 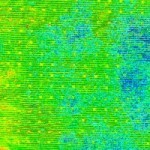 LiDAR data will produce far more accurate depictions of topography than what is available today. Digital Elevation Models (DEMS) are produced from LiDAR data at a much higher resolution than USGS DEMS. LiDAR produces elevation models of the terrain at ground level as well as at the highest surface (buildings & tree canopy). 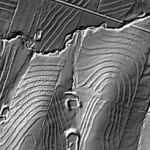 LiDAR data is capable of producing 1 foot elevation contours. Potential beneficiaries of high resolution DEMs and 1 foot contours in Sonoma County include city and county planning departments, land managers, farmers, builders, and engineering firms. 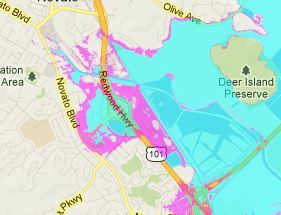 Sea level rise will affect Sonoma County along the Pacific Coast and in areas adjacent to the tidal wetlands of Southern Sonoma County. 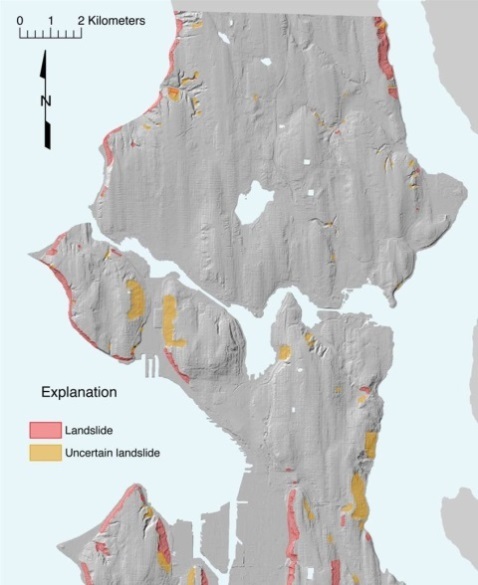 LiDAR data (combined with accurate bathymetric data and advanced modeling techniques) produces very accurate projections of coastal inundation as a result of storm surge and/or sea level rise. 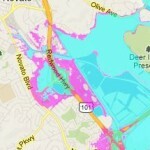 County planners and the California Department of Transportation (CalTrans) will benefit from LiDAR data when planning for the effects of sea level rise on the Sonoma County baylands and on Highway 37 in southern Sonoma County. 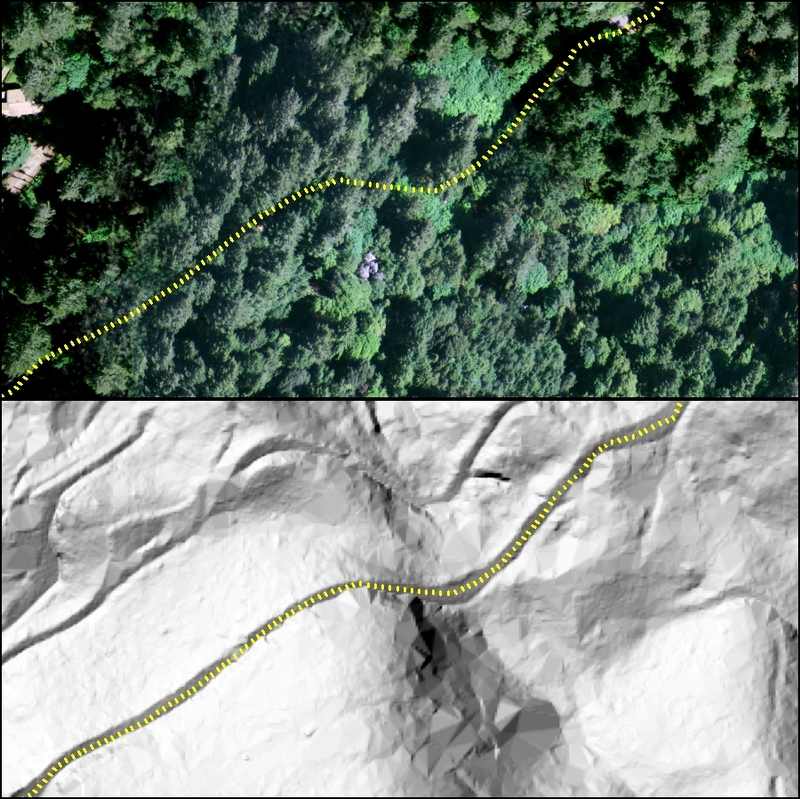 Since LiDAR penetrates the tree canopy, creating a very detailed model of the bare earth surface, LiDAR is a valuable tool for mapping faults, landslides, and debris flows – especially those obscured by vegetation. 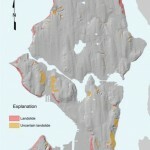 LiDAR is also used to produce landslide susceptibility maps. See the video at the end of this post from the Southern California Earthquake Center – it provides an overview of LiDAR and how it is used to identify and map earthquake faults. 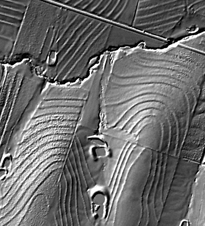 LiDAR produces very detailed contours and elevation models useful for engineering planning. 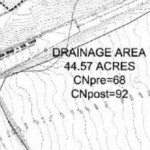 Uses include transmission corridor and pipeline planning, storm water modeling, drainage analysis, cut and fill analysis, master planning, grading, erosion control, and roadway design. LiDAR is very effective for and for evaluating the relative merits of alternative sites for a project. LiDAR is used in numerous water related engineering planning activities such as diversion channel routing, hydraulic analysis, flood control impoundment planning, cut and fill analysis, and 3D project visualization. High resolution topographic data (usually derived from LiDAR) is necessary for flood inundation mapping. Dam breach analysis and resulting flood inundation mapping often relies on LiDAR data, which provides much more accurate results than analysis using 10 meter USGS DEMs. 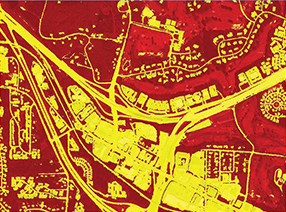 LiDAR data aids in the effective mapping of pervious and impervious areas across a landscape. Maps of pervious and impervious surfaces are useful for managing and modeling stormwater runoff, hydrologic modeling, habitat modeling, and urban planning. 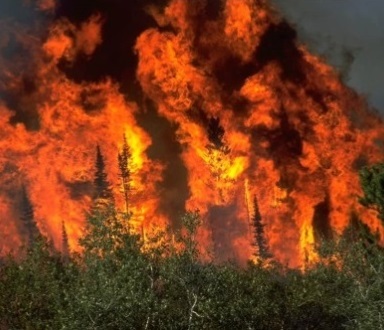 Because it depicts the forest in three dimensions, LiDAR data improves the accuracy of fuel maps and increases the accuracy of fire risk and fire behavior models. LiDAR is increasingly used by state and federal agencies to assist in mapping fuels, fire risk, and fire behavior. The video below from the Southern California Earthquake Center provides an overview of LiDAR and how it is used to identify and map earthquake faults. This primer/FAQ on LiDAR from NED (National Elevation Dataset) provides a good technical overview of Airborne LiDAR. Course information (including lecture materials) for Penn State’s “LiDAR Technology and Applications” Course (Geography 497D). See the course outline (bottom left) for access to lecture materials and readings. NOAA Coastal Service’s Center Digital Coast web site for downloading LiDAR data and other coastal datasets. The web site includes access to the 2009-2011 LiDAR collection (2 pts./square meter) that includes coastal areas of Sonoma County. This entry was posted in LiDAR, Mapping on May 2, 2013 by mtukman.